In which book of the Bible is the story of Gideon recorded? In SEVEN major Festivals here in America, plus others in England, Australia and around the world - a glorious season was observed this year! "THEREFORE let us KEEP THE FEAST..." (I Cor. 5:8). 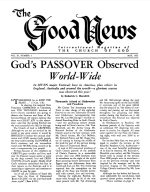 In obeying this inspired New Testament COMMAND to Christians, over TEN THOUSAND brethren of God's Church assembled this spring to observe the Passover and Feast of Unleavened Bread. All reports indicate that there was GREAT JOY in this observance - and that this spring Festival was the most successful ever held in this age. The Church of God is GROWING. Although we are not yet noticed by the world to any great extent, it would be SHOCKED to realize the unusual dedication and LOVE among God's people, the deep understanding and POWER of God's ministers, and the tremendous world-wide WORK being carried on by such a comparatively few people!